Thanks to Elmer's and Mead for the supplies used in this post. All opinions are my own. Back to school supplies are popping up in stores everywhere right now, which means summer is slowly coming to an end. The only thing better than brand new school supplies is being able to make them your own! I'm excited to share some DIY back to school supply inspiration using products from Mead and Elmer's to get your kids excited to start the school year off with some personalized school supplies! Let's start with my personal favorite: the Mead Trapper Keeper Binder! I used to have one of my own when I was in school, and loved it! I was always excited to organize all my school supplies in one place, and looked forward to choosing from the large array of Trapper Keeper designs available each year to carry in my new backpack. 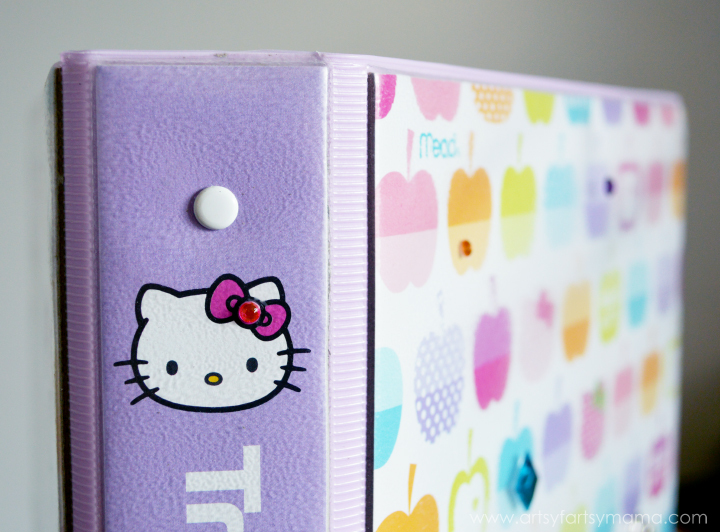 My daughter loves Hello Kitty, so naturally the Hello Kitty Trapper Keeper Binder was a hit. We decided to dress it up by adding some bling to the outside. We used Elmer's X-Treme School Glue to attach gems in different sizes and colors because of its stronger hold than regular school glues. Plus it's washable so you don't have to worry about letting your kids go crazy decorating their supplies. To attach the gems, add a small drop of glue to the back and press it on the Trapper Keeper. Make sure the binder is lying flat while the glue dries so the gems don't shift or slide off! Once the glue dries, the binder is ready to use! We added gems randomly to the front of the binder, on Hello Kitty's bow on the spine, and on the flap. My daughter loves the extra sparkle, and there won't be anyone showing up to school with *exactly* the same thing! 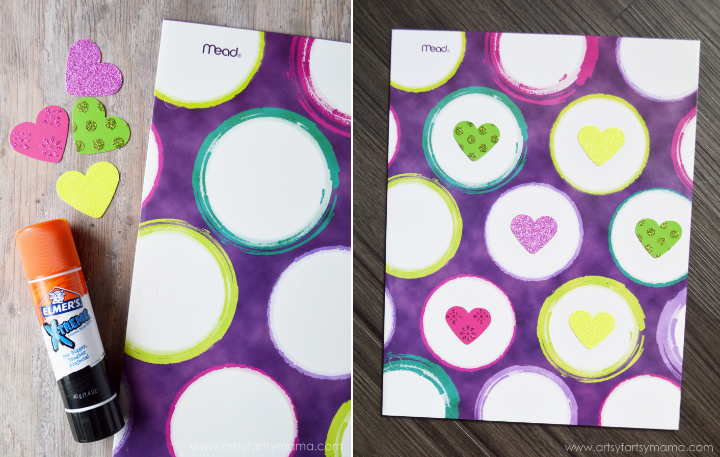 Personalizing folders is super easy, too! You can get Mead folders in tons of designs, and some are even designed to coordinate with the Trapper Keeper. 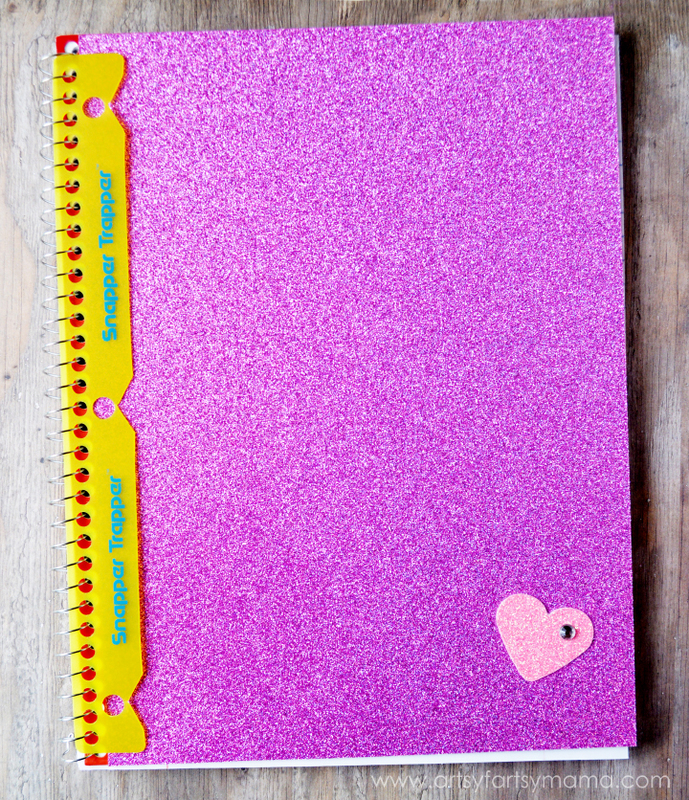 We cut some hearts out of glittery cardstock (to coordinate with Hello Kitty) in colors that matched the folder, and simply glued them on with Elmer's X-Treme School Glue Stick and let it dry. You could also glue on gems and other embellishments to make it your own! You can find Mead notebooks for awesome prices in all different sizes, colors and patterns. This red one fits perfectly in the Trapper Keeper with the Snapper Trapper binding, but the red color just didn't match the rest of the folders! So, with a little glitter cardstock and glue stick, we were able to personalize it in a snap! 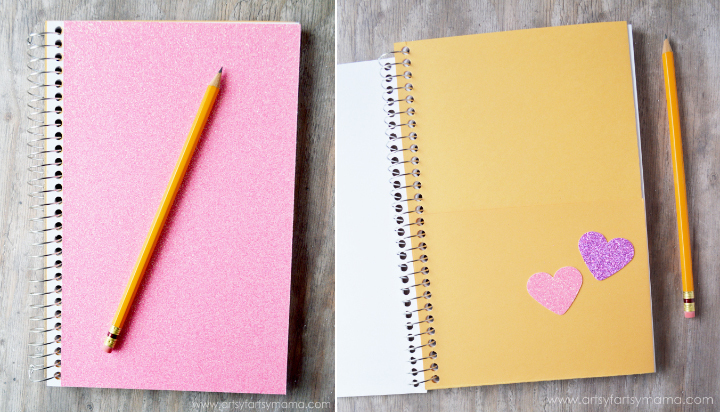 Measure the notebook (up to the wire binding), then cut a piece of glitter cardstock to fit. 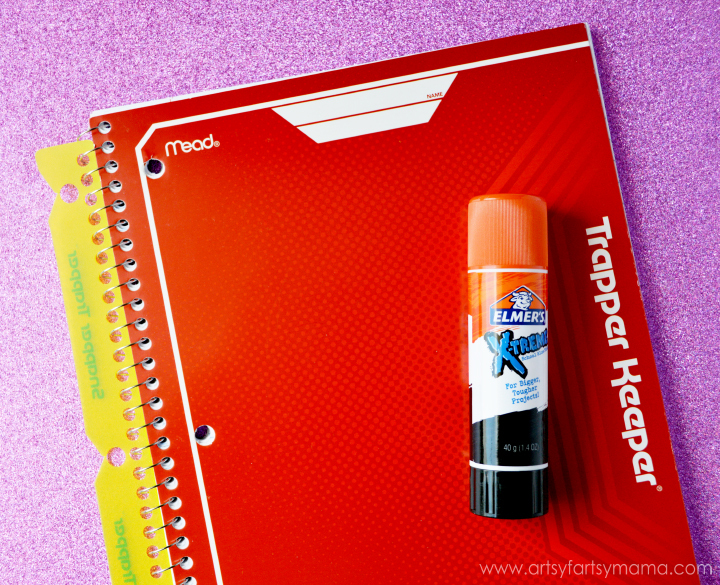 If you don't have the Snapper Trapper on the binding, be sure to mark where the holes need to go and punch them out with a hole punch so you can easily put the notebook in the binder when you're done. Cover the back of the cardstock with a good amount of glue stick, making sure to get the edges and corners covered really well. Align the paper with the edge of the notebook cover, and smooth it out and press it down with your hands. If needed, place something heavy on top until the glue dries. We also added a heart with a gem embellishment to the corner of the notebook to bring in the Hello Kitty theme. Even though it won't snap into the binder, we also decorated a Mead Academie Wirebound Sketchbook with a glitter cardstock cover, and added a couple of glitter cardstock hearts to the folder inside the sketchbook with X-Treme glue stick. Don't forget to add some Elmer's School Glue and glue sticks to your pencil case! When it comes to personalizing your school supplies, the possibilities are endless. I hope we've inspired you to get creative with your back to school supplies to make them the best looking supplies of the year!! 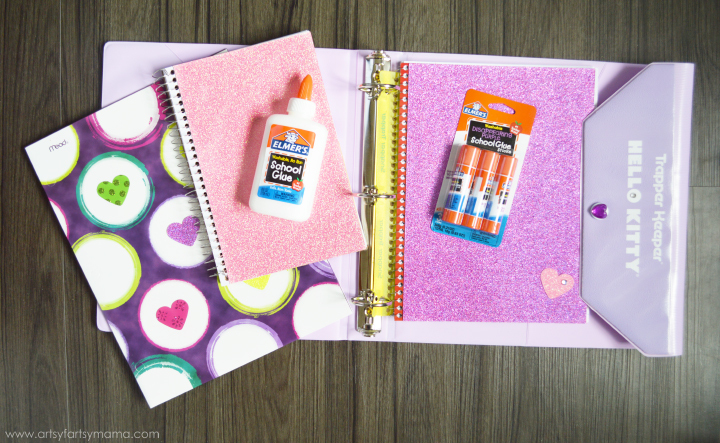 To really kick off Back to School season, join me to chat about school supplies with Elmer's and Mead at a Twitter party on August 4th from 12pm - 1pm ET! Hope to see you there! 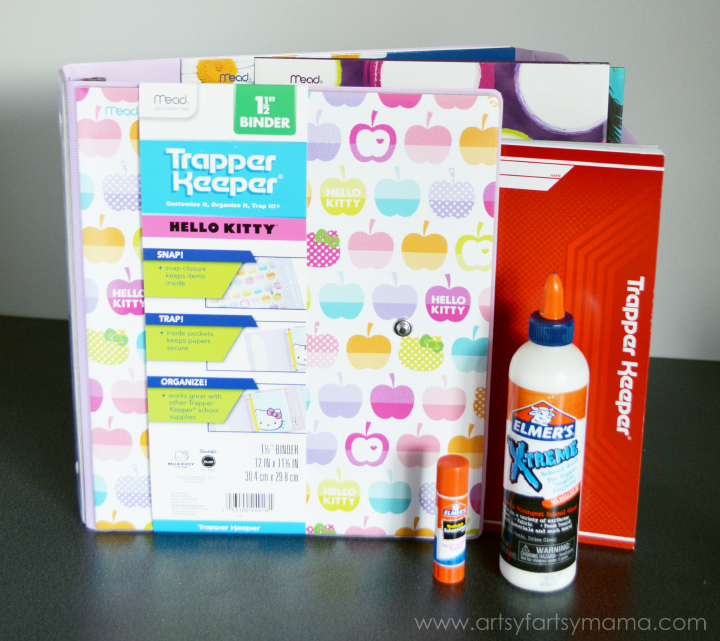 You can't find anything better than a Hello Kitty Trapper Keeper! What a cute way to decorate a spiral notebook. SO dang cute! Thanks for sharing your creativity with us! these are lovely!must be more fun to go back to school with such cute notebooks! Love the fun details, especially the hearts! So creative! I haven't seen a traffic keeper for YEARS! Love how you decorated it. Oh man! I didn't know they still made Trapper Keepers! Um Hello Kitty Trapper Keeper, please.